Everyone has their own morning routine, their own private formula for embracing the new sunrise. For some it may be yoga stretches, turning the dog out, or blearily trying to remember if you own a pair of jeans that isn’t currently covered in cow manure or shredded by barbed wire. For others, it might involve the scent of coffee and buttered toast, or a trip to the hen house for the freshest eggs an omelet could hope to meet. In my case, however, the morning isn’t complete without a steaming mug of golden brown… bone broth. I admit it. I’ve never been much of a coffee girl. The smell is, of course, heavenly, but I could never get past the taste. Tea, on the other hand, is a different story. Six months in England in my early twenties turned me into a black-tea addict. Unfortunately, that tea was always accompanied by a generous helping of cream and sugar. (Yes, I actually put cream in my tea instead of milk. Tea aficionados feel free to be horrified.) Needless to say, the combination turned out to be somewhat unfriendly to my waistline. But what’s a girl to do without her warm cup of soothing goodness in the morning? Enter bone broth. 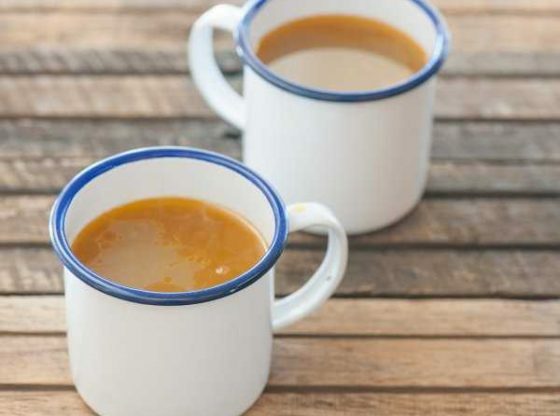 Anyone who pays any attention to the whole food/natural food/traditional food cooking-scene has likely come across some mention of the luscious health benefits of bone broth. In some ways, it’s become another fad. Whole cookbooks are dedicated to the stuff and bone broth bars are even edging in on the coffee-shop business in some of the bigger cities. But would someone actually want to drink it straight? I’m sure my facial expression was suitably comical when I first came across that suggestion. Surely only a special type of hard-core-extra-crunchy-health-food-junkie would attempt that. But with the carcass of a recently roasted chicken sitting in the fridge and a simple broth recipe in my newest, shiniest cookbook, I decided I had nothing to lose. The result was two quarts of the richest, most mind-numbingly delicious liquid I had ever tasted. I drank the entire batch before noon and was craving more. Seems my body knew something I didn’t. Turns out all the hype is true. Bone broth is about as close to the mythical elixir of life as you can get. It’s loaded with calcium, phosphorus, sodium, magnesium, and a whole host of nutrients I can barely spell, let alone pronounce. But the star of the show is the gelatin. The benefits of gelatin have filled entire books. Not only does it aid digestion, especially of cooked foods, it allows the body to more fully access protein leading to a lower protein requirement. For those of us who cringe every time we check the price-per-pound of our favorite cut of steak, this is definitely good news. When it comes to our gut, gelatin can be a lifesaver. Intestinal permeability, otherwise known as leaky gut, is the bane of many people’s existence. Gelatin has been proven to heal the permeability and restore the mucous lining of the gut. If your motivations are more cosmetic than medicinal know that gelatin actually reduces wrinkles better than botox. It promotes healthy hair and nail growth and has been shown to improve dental health. It does all of this while building strong bones, improving wound healing, preventing and mitigating infectious diseases, reducing allergies, and healing your adrenal glands and thyroid. In ancient China and Japan, it was used to treat bleeding of the stomach and intestines. In 1759, doctors in Nuremberg used gelatin to treat dysentery. In the 1800’s it was even put into action against abdominal typhus with excellent results. Today it is used successfully to treat joint pain, arthritis, hyperacidity, ulcers, colitis, and Crohn’s disease. It’s even proven useful against anemia, diabetes, muscular dystrophy, and cancer. So, how do you make this wonder drug in your own kitchen? To begin, you need bones. Lots of bones. When you eat T-bone steak, save the T. When you’ve finished picking the meat from your roast chicken, toss the carcass in the freezer. I keep a bag on hand where I dump all my meaty leftovers until I have enough to begin a batch of broth. Then I simply follow the recipe below. 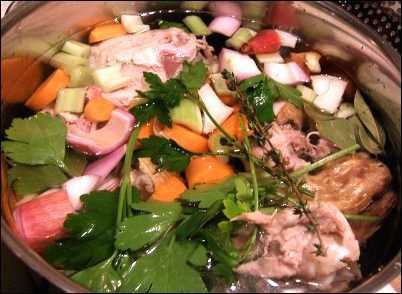 Begin by dumping the bones, vinegar, and salt into a large stockpot. Add enough water to fill the pot. Bring the water to a boil over high heat. Turn it back down to a simmer and cover the pot. Allow the broth to simmer for at least 3 hours. If you want to get more nutrients out of the bones let it go longer, but 3 hours should be enough to give you a decent flavor. 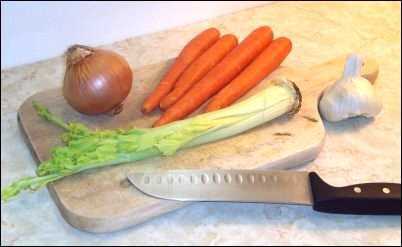 Roughly chop your vegetables and add them to the pot. If you need to add more water to fill the pot you can do that too. Leave the broth uncovered and return it to a boil. Allow it to boil for 1 ½ hours until it is reduced by about half. Strain the broth through a colander and transfer to the fridge. Once it is cooled you should be able to skim the fat off the top. You can store it in the fridge for up to one week or move it to the freezer for long-term storage, though admittedly mine very rarely makes it to the freezer. I’ve usually drunk the entire batch within a few days. Once your golden broth is in chilled storage, don’t throw out your bones! If you want to be really frugal, fish the bones out of the veggie mix and throw them back in the pot for another round. You should be able to get two to three batches out of a single pot of bones before your broth stops gelling (a sure sign that all the collagen has been extracted). If your broth doesn’t turn to a savory Jell-O once it’s been thoroughly chilled you can boost the nutritional content by reheating it and adding in some grass-fed gelatin powder. If you want to mix things up, feel free. Bone broth is infinitely flexible. It is the catch-all for whatever leftover scraps you have on hand. Try parsnips instead of carrots, or fennel instead of celery. Use carrot peelings and onion skins. If you have egg shells you can even throw them in with the bones at the beginning to give the broth extra calcium. No chicken bones on hand? If you have beef or lamb bones, or the carcass of any other large ruminate, use them instead. In that case, the initial cooking time will need to be increased to at least 4 to 5 hours, but that is the only alteration you will have to make. I will admit, while I prefer the flavor and control cooking on the stove top gives me, sometimes the thought of scrubbing my stockpot repeatedly as I try to produce enough broth to cook with as well as have a mug full every morning is not very appealing. This is where continuous broth comes into play. Continuous broth is most easily made using a crock-pot or slow cooker. 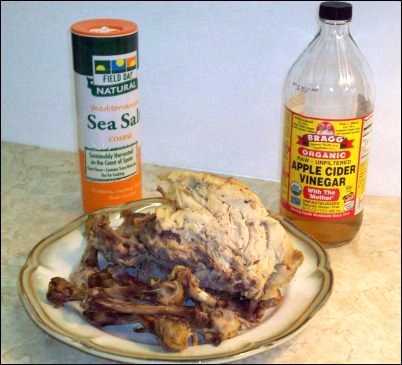 Dump the bones, vinegar, salt, and water into your crock-pot. Turn it to high for the first hour, and then switch it to low. Every appliance is different so you’ll have to adjust your temperature accordingly, but ideally, your broth should sit at a gentle simmer, not a full boil. If you have vegetables you want to add, throw them in, too. After 8 to 10 hours you can begin ladling out broth as you need it. If you top up the water level every time you remove some liquid, you should be able to keep the broth going for up to a week. That’s a whole week of homemade broth to cook with rice or beans, blend into gravy, or use to baste meat. At the end of the week, it’s generally a good idea to empty out the pot, wash it, and start over fresh. You may also wish to fish out and replace the vegetables every couple of days as they lose their flavor quickly. Keep in mind however that it is possible to cook broth too long. Broth made from beef and similar bones can go a fairly long time. Smaller creatures, such as chickens, require a shorter cooking window, generally less than 48 hours. If you are continually using and replacing the liquid this may not be an issue. But be aware that over-cooked broth can turn surprisingly dark and bitter. I’ve experienced it myself and can assure you it was a sad day when I had to dump out an entire pot of unusable broth simply because I got overzealous on the cooking time. If you’re concerned that you may not use the broth fast enough to keep it from overcooking, simply ladle out the broth every couple of days and move it to storage. Add fresh water and keep the bones going until they turn soft and crumble. Once you’ve made quart after quart of your beautiful broth the next question becomes how do you store it? Having enough homemade broth on hand for cooking as well as pouring a steaming mug full every morning can quickly fill up your freezer. And for those of us aspiring to off-grid living, freezing broth may not be an option at all. The answer is homemade broth-powder. It not only saves space in the freezer, it makes a wonderful travel food, allowing you to continue consuming your magical miracle drink even while on the go. Start with that pot of gorgeous broth you’ve just pulled off the stove. Some sources recommend leaving out the salt in order to control the sodium content of the final product, but I make it just as I’ve listed above. After you’ve drained it through a colander to remove the large pieces of bone and vegetables, line the colander with cheesecloth and pour the broth through again. You want to make certain there are as few solids in the broth as possible. After it has been thoroughly strained, pour it into wide-mouth jars and move it to the fridge. A few hours in the fridge should be sufficient for the fat to congeal at the tops of the jars, making it easy to scrape off. While I don’t always scrape the broth when I know I’ll be dumping it into a pot of soup, dehydrating broth is a different matter. The oils and fats, if left in, can go rancid quickly; nor do they dehydrate very well. So when it comes to broth you plan to dehydrate, be certain to scrape ALL of the fat off the top. Don’t worry too much if a little of the broth comes off with it. There will still be plenty left. Dump the defatted broth into a clean stockpot and return it to the stove. Bring it to a boil. Once the broth has reduced down and begun to get thick, turn the heat down to a simmer. Keep a close watch on it at this point so it doesn’t burn. You want the consistency to be thick enough to spread but not so thick that you can’t spread it thinly. If you remove it from the heat and it forms a skin as it starts to cool, that’s a good sign it’s ready to dehydrate. However, don’t allow it to cool too much or you’ll have difficulty spreading it. At this point, you can spread the thickened broth on the solid non-stick sheets that came with your dehydrator. If you don’t have any, parchment paper should make an acceptable substitute. Spread it as thin as possible. The thinner it is when dry the easier it will be to grind into a powder. Set your dehydrator at the highest temperature and let it go for at least 24 hours. You can check it at that point but most likely it will take a couple of days to be completely dry. What you are aiming for is hard and brittle. If it’s the consistency of fruit leather then it needs to keep going. Once the broth is dried break it up into small chunks and feed it to your food processor, Vitamix, or high-speed blender. You could even use a mortar and pestle if so inclined. Regardless of which method you choose, grind the broth into as fine a powder as possible. The finer it is the faster it will dissolve in water when you reconstitute it. One teaspoon, give or take, of powder should give you one cup of broth. Your finished bouillon can be stored in an airtight container in the cupboard. Adding a food-safe nitrogen packet or oxygen absorber can help prevent humidity and maintain its shelf life. If the thought of dehydrated meat juice sitting in your cupboard concerns you, however, feel free to move it to your freezer. It will still take up far less space than a quart jar. So, the next time you find yourself craving something hot and soothing to drink reach for the stock pot instead of the coffee pot. Pour yourself a cup and remember the explorers who searched vainly for the mythic fountain of youth and the alchemists who sought the magic elixir of life. Lift your mug and congratulate yourself that the broth of immortality is now simmering quietly on your own stove.